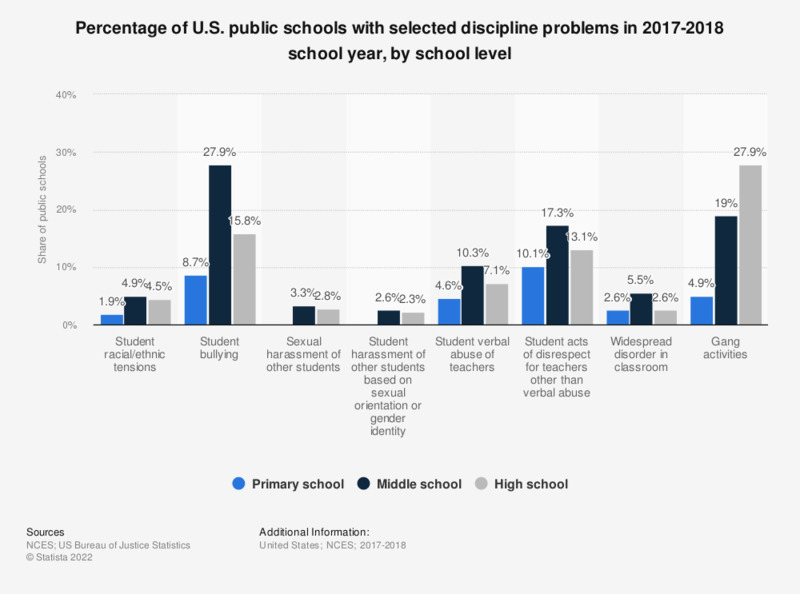 This graph shows the percentage of public schools in the United States with common discipline problems in the school year 2015-2016, by school level. In that year, 3.2 percent of high schools in the United States reported racial or ethnic tensions among their students. Primary schools are defined as schools in which the lowest grade is not higher than grade 3 and the highest grade is not higher than grade 8. Middle schools are defined as schools in which the lowest grade is not lower than grade 4 and the highest grade is not higher than grade 9. High schools are defined as schools in which the lowest grade is not lower than grade 9. Combined schools include all other combinations of grades, including K–12 schools. Responses were provided by the principal or the person most knowledgeable about crime and safety issues at the school. “At school” was defined for respondents to include activities that happen in school buildings, on school grounds, on school buses, and at places that hold school-sponsored events or activities. Respondents were instructed to respond only for those times that were during normal school hours or when school activities or events were in session, unless the survey specified otherwise.